Rigid Collodion Scarring Liquid is a clear solution created for Special Effects Makeup work to create the effects of scarring skin. When the Rigid Collodion Scarring Liquid is painted onto a small area of the skin as it dries it wrinkles the skin. You can create larger scarring effects by repeating the application of Rigid Collodion Scarring Liquid. To remove Rigid Collodion Scarring Liquid you simply peel it off. 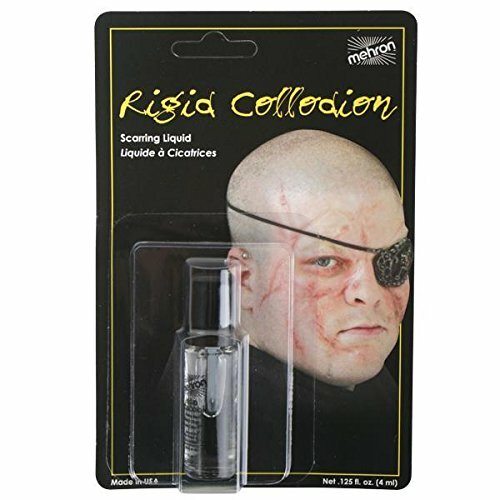 For the Professional Special Effects Makeup Artists you will notice the difference with our Rigid Collodion Scarring Liquid, for the novice a little practice will make you an expert at creating scarring effects.